I did it, it was rough at times, but I made it through. Today being the first day of Advent, I've been thinking about the concept of Advent. If I'm being honest, I don't think I've ever really thought much about the purpose of Advent. Yeah, yeah, I've known that Advent is the season in which we prepare for the coming of our King to the Earth for the first time over 2,000 years ago. This is a huge deal. The biggest deal. So yeah, we need to prepare our hearts to fully celebrate and embrace this momentous occasion. So, this year, I'm going to make a personal effort to really participate in this Advent season. Yes, I want to look forward to Christmas, but I also want to experience the preparation to get there. I love Christmas, I think most people do, but this year I hope to experience it in a new and fresh way. You know how we always say Happy Thanksgiving and Merry Christmas. Well, I'm going to start saying "Joyous Advent." Side note: I'm also really excited because I'm already mostly done with my Christmas shopping and am super excited about most of the presents I'm giving. It occured to me that God must have been even moreso excited about giving us the gift of His Son. So this year as you give gifts, I hope that you can be excited and can remember what a precious gift that baby boy, God in human form, was to each and every person. 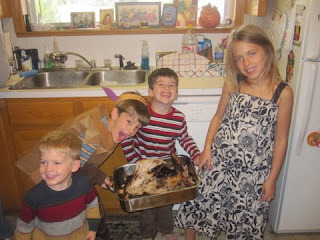 Oh, and here's a picture my sister took on Thanksgiving Day. Man, I really need a camera! Random thought/fact of the day: I'm speaking in chapel tomorrow at my soon to be alma mater, SWBTS, Houston campus. It's not a big deal, but if you think about it, shoot up a prayer for me! My gracious Heavenly Father. You know, at different time in our life I think we appreciate different characteristics of God. Of course I am thankful for His unending love, His saving grace and His hand of protection in my life, but this year, at this point in my life, I am learning to appreciate His faithfulness to me, personally, each day. My God has been with me each step of my life, guiding me, preparing a way for me, and He will continue to be faithful as He shows me each day what He has for me and how He wants to use me to bring honor and praise to His name! Ofcourse I am thankful for an amazing family. Don't get me wrong, we're not perfect, but I wouldn't trade them for the world. My parents are always supportive, my sisters are always available and the kiddos are always good for a laugh. I love love love spending time with them all and am so grateful that we all live within just a few hours drive of eachother. I am thankful for an amazing church family, a wonderful place to serve. It's amazing that I've been there almost 5 years now. It's a place I feel at home, a place I feel invested. I am ever grateful for how much I have learned in these first 5 years of ministry. Of course I am thankful for dear friends in my life. I am thankful for those friends that I share life with day in and day out. Those friends that walk through stuff with me. Friends that I call when I'm stressed or excited or sad or confused. Friends that I laugh with and yes, sometimes even cry with. I am thankful for friends I share ministry with, a great group of Jr. Staffers. I am thankful for old friends that know me. Friends that make an effort to keep in touch. I know this all sounds generic, but it's very true in my life! I'm also thankful to God for all of the provisions in my life. He has given me a job that I love, a safe place to live, a new car to drive and food each day. My gracious heavenly Father is so abundantly generous to me. Random thought/fact of the day: I'm so excited, I've already gotten 2 birthday presents!!! A fun new blingged out belt for the rodeo, and seasons 9 & 10 of Friends (a collection I've always wanted, but never started)! Fun times! Yup, I was up at 4:30 this morning to get Black Friday deals. What was worth getting up that early for? Oh, nothing in particular. My sister got some good deals and I picked up a few things, but nothing major. I was able to cross my dad off the list, so that's good! Sorry for the quick post. Nablopomo is killing me, but I can't quit now, right? Random thought/fact if the day: I tried sweet potato pie for the first time today. It was good, but not life changing, or anything like that. Hope you had a wonderful Thanksgiving. We did! Even though my mom was down for the count, which she is feeling much better now. Random thought/fact of the day: I have THE best nieces & nephews in the world. Soooo sorry I didn't get any pics with my phone today to share. Not gonna lie, I'm growing weary of this posting every day thing. We'll see if I finish strong. Goodnight. Sorry, that's all I got in me. Look forward to some pics of the 3rd annual Thanksgiving Day Cousin Parade! Random thought/fact of the day: my family eats fried turkey for Thanksgiving, and I love it! Last night I went to dinner with 4 girl friends to celebrate a birthday. All 4 of their husbands were getting together to hang out. 5 girls, 4 husbands, you do the math. Can you say, odd one out? One of these things is doing it's own thing. Also, at one point during our conversation I mentioned the movie, He's Just Not That Into You." Let's just say none of them knew what I was talking about (and incase you don't either, the movie is about being single and the many trials of dating). This really isn't a complaint, I'm grateful to have girlfriends to hang out with that are willing to kick the guys to the curb for a girl's night out! Random thought/fact of the day: I found a pair of pants today that I had totally forgotten about since last Winter!!! Always a fun find! Woops, I almost forgot to post today! Busy evening, dinner with friends to celebrate a dear friend's birthday! Then we headed back to one of their houses to watch the Finale of DWTS. It was slightly disappointing, can't wait to see who wins tomorrow. Random thought/fact of the day: I heard recently that if you have the hiccups and someone walks up to you and says, "purple," that the randomness of it will distract your mind and you will no longer have the hiccups. My dad ALWAYS tried to scare the hiccups out of us...maybe this is the same tactic, but with different execution? Thoughts on this? Please share! Yesterday and today were both busy days. Yesterday I helped host a shower for a new girl that helps teach in one of our Kindergarten Sunday School classes. She was so appreciative, it was really sweet to see her showered with love and gifts. Everything turned out nice for the shower, especially the little petifores we had ordered, always a crowd pleaser! Then today I had a necklace party to show my sisters' stuff. We had a good group show up and sold lots of stuff, I think they'll be pleased! It was fun to have people come and be so complimentary of their stuff. I knew I liked it, but it's fun to hear that other people do too! The only bummer was that I had to miss my Sunday afternoon nap! This week should be relatively quick and quiet. Of course, I'll be wishing the whole time that I was already in Temple with my parents & sisters & the kiddos, but all in due time. Here's to hoping my Fantasy Football team pulls off a win! Random thought/fact of the day: I've been slightly stuffy/congested/sore throat for a few days now. Mainly worse at night and in the morning, you know, that type of thing. Thankfully it's not slowing me down too much thought. Hopefully I'll kick it in the next few days and it doesn't develop into anything! find subs to help in preschool on Sunday morning - check! make belt buckle for my sisters' jewelry business - check! pick up a few things for a shower I'm helping host tomorrow - check! get a few groceries for some dips I'm going to make, and pick up a few other things - check! lounge and enjoy my day off - most definately, check! have the maintenance guy come and check my toilet, the handle part isn't working, yes I can still use the toilet, just have to remove the lid to make it flush...annoying - check! Not too shabby, huh? Too bad the 2 things I didn't do were things that really should have gotten done. Ah well, they were just tooo easy to put off, neither one of them HAD to be done yesterday...ah well, let's be positive and focus on the rest of the list that I DID get done! OK, now it's time for a story. A self depricating story, but hopefully it makes you laugh, and therefore is worth my humliation. So, this morning I had a trashbag with food in it that needed to be taken out. Of course, I live in an apartment and the dumpster is in the corner of the parking lot. Not terribly far from my apartment, but far enough that it's out of my way. I was headed out to get some Starbucks as a treat on my day off and took the previously mentioned trash bag down with me on my way to S-bucks. When I stepped outside I realized it was raining, not the best time to take the trash out, but I didn't want to leave the bag with food in it in my apartment. Often times I will just walk over to the dumpster, toss the trash, and then back to my car. Yes, it involves some backtracking. So, sometimes, in attempt to be lazy save time I am known to leave my driver's side door open, holding the trash outside the car and slowly drive over to the dumpster. Today, since it was raining, I really didn't want to walk over to the dumpster and then back to my car. So, I opted to hold the trash with my door propped open, only it was raining. And of course, I couldn't let me or my car get wet, so I also held an umbrella over my propped open car door, sheilding me, my seat, and the trash from the rain. I can only imagine what someone thought if they saw this strange act! Sorry if I didn't do a good job describing this. I just wanted to know, am I the only one that does stuff like this? If you live in an apartment and have done similar acts, please share! Random thought/fact of the day: My sister, Katy, and I have decided that we will brave the crowds and join all the crazies that will be out early on Black Friday for amazing deals!!! This is only my second year to join the madness, hoping to nock off another good chunk of names on my Christmas list. I'll be sure to let you know how it goes! PS - I updated my blogger editor, but now there's no spell check. Anyone out there know what happened to it? Random thought/fact of the day: I heard today that Nestle, the main company that provides canned pumpkin, had a bad crop year and it is expected that there will be a shortage of canned pumpkin in the grocery stores. So you better load up now! After I had given them my home and office addresses it asked for my spouse's information. I'll have to leave that area blank, thanks for rubbing it in. The next question was, "Is spouse a graduate of SWBTS?" What spouse? Please note previous section is BLANK!!! The next section wanted information on my children. I'm relatively sure that if I had children, but wasn't married, I wouldn't have been admitted to SWBTS (unless there were extenuating circumstances). So no, I'm not married, and I don't have kids. If you are single, do you plan to get married in the next 3 months? It's opptimistic, but I suppose anything is possible. Hope you got as big a kick out of that as I did...yet another moment where I felt extremely single, good thing I can laugh about it. Good times, good times. Random thought/fact of the day: Sarah Beth Rowe is my favorite blogger because she often leaves comments. Sorry guys, don't take offense, just let it inspire you to join her in leaving more comments! Those are my faves. If you have an iphone, what are your fave apps? Please share! Random thought/fact of the day: I had to type 2010 for the first time today, that was a weird moment. Ready or not, here it comes. I think I may have eluded to how much Christmas shopping I got done last weekend. Allow me to demonstrate how much progress I made. And please note, this is BEFORE Thanksgiving! Do you realize that I have 10 out of 16 people checked off the list! Let me just tell you, it's an amazing feeling! I usually get so super stressed about finding presents for so many people, and I want it to be just the right thing for each person, but having so many people checked off is a great feeling (that is until I look at my checking account). And the best part is, most of the presents I have already bought, I'm super excited about and can't wait to give it to them! Random thought/fact of the day: I found out today that since I'll be celebrating 5 years of service at Tallowood in January, I will also pick up an extra 5 days of vacation each year!!! Woohoo! I'm already dreaming of a fantastic vacation! First, remember how I had to be at the church at 7am this morning to meet the bus that would take us to the George R. Brown Convention Center? Well, I was nice and on time myself, but 2 of my friends could not say the same. I had spoken with my friend Claire last night about getting to the church on time, so when the bus started to pull out without her, I shouted to LH, the guy in charge, that I thought Claire was still coming. LH said she would just have to meet us there, we were leaving. So I called her to see where she was. She said she was turning onto the street that the church is on. So I told LH, and he said we would wait. Whew, she was cutting it close. But then when she got on the bus she asked where Micah was. We said he wasn't there yet, that he was going to have to meet us at the Convention Center. She called him and he said he was exiting the freeway for the church. LH said we couldn't wait. So we pulled out from the church and passed him at the corner, but there was no going back. He didn't end up coming. Oh, the drama! I don't think he wasn't too happy that we didn't stop for him! So, we were all given matching white button up shirts with a green Tallowood logo on it. Since I was out of town this weekend, I didn't get my shirt til this morning. Well, I wanted a women's large, but all my friend was able to get me was a women's XL. I was a bit disappointed, but figured it would work. That was until I put it on. Something wasn't right. This thing was H-U-G-E. Oh, wait, it's a men's XL. I'm not kidding. Can you say potato sack? Thankfully, Claire had also picked up a shirt for Micah, who wasn't coming any longer, and he had a men's large. So at least I could downsize to the large. It was still huge, but I rolled up the sleeves and tied a ribbon to cinch the shirt and add a little style. Trust me, it wasn't ideal, but it was the best I could do. Ok, one more funny story from the day, that may or may not translate well in text, but trust me, it was hilarious at the time. So, as greeters, we were given booklets with all the information we could possibly need if someone asked us a question. My friends and I were stationed by the escalator, sending participants on up to the 3rd floor. Claire had dropped her book on the floor, just inches from her feet. She was sick of holding it, and figured it was fine for the book to just sit on the floor near her. She was wrong. Randomly, as a man is walking past her, he reaches down, picks up her book, takes it and keeps on walking. I'm not kidding. He didn't say a word to her, ask her if it was her book, nothing. Claire was so stunned she couldn't say anything. We just stared at each other trying to figure out if that had really happened, then we busted out laughing. Other than that, it was just fun to see lots of people I knew from growing up in Corpus. Some of my parent's good friends, former pastors at FBC, Corpus and even my Aunt was there! Super fun! 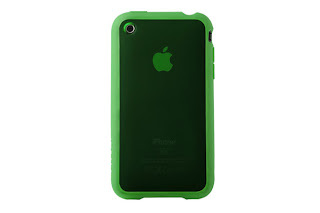 Random thought/fact of the day: update on my complaint about my iphone cover...they are sending me a new one!!! I'm so excited! I guess it should be here later this week! I'm very impressed with this company! after a full weekend with friends and family and lots of traveling, i'm one tired cookie. sorry, that's all I got in me, I'll work on better posts this week. Oh, and I realized that picture I put up yesterday wasn't very good. Here's a better pic of my twin, no, that's not me. ha! Random thought/fact of the day: I get to be a greeter for the BGCT tomorrow, the bummer part is that I have to be at the church at 7am. You can count on a story or pic from that excitement tomorrow. Today was a last minute shopping day. I'm in Dallas hanging out with Kelly & Brandon. We were planning to shop, but weren't sure where. All I knew was I wanted to do some serious Christmas shopping. Well, Kristy called and wanted to hit up the Jr. League of Plano craft show. So we did!!!! And let me tell you, IT WAS AWESOME!!! I think I got atleast half of my Christmas shopping done!!! So. Much. Fun. And especially great to get some quality time in with 2 out of 3 of my sisters!!! 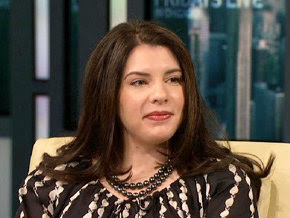 Random thought/fact of the day: this is the lady who writes the Twilight series, who looks amazingly like me. What do you think? Who's idea was this anyways? Sorry guys. This week has been abnormally busy, making this whole nablopomo thing super hard. Sorry I am tardy again, but this post is counting for Friday and I'll hopefully post again tomorrow (Saturday). Random thought/fact for the day: I found out tonight, I like goat cheese (at least at the restaurant that I went to tonight). It's 2am. I never posted for Thursday. I'm just now going to bed, so to me it's still Thursday. I'm going to count this as Thursdays's post and then I'll post again later today to count for Friday. My sister, Katy and I have been up creating necklaces. Fun, but I'm exhausted. Random thought/fact for the day: my less than 5 month old car has 8,000 miles on it already! Sad day! I spent my morning setting up preschool furniture that we donated to a small church in Corpus. Then we tried to get lunch at my fave place in Corpus. Apparently they aren't open for lunch anymore :( so we went to another yummy Corpus icon. I'm home now and have to get cleaning because my mom and her friends are staying at my apt on Friday night. Random thought/fact of the day: I much prefer having someone ride in the car with me on a trip. It was fun having you on the trip, Abby! I must admit, I am sqeezing this one in. Susan & Joe & I are in CC at my parents and after a nice dinner we've been talking all night and I almost forgot to post. It has been fun being home and showing them around where I've grown up! Random thought/fact for the day: my boss and my mom have strange similarities. Is there a deeper psychological meaning in that? ...I'm headed out to CC tomorrow, and am very excited for a super quick trip! ...I get to see Jeff, Erin & baby Haydn!!! ...my mom called last night to tell me that she and 2 of her friends are coming to Houston this weekend and are staying at my apartment. WHAT? My place is a mess and I'm not even going to be here! Yikes! Better get cleaning! ...when I got my haircut the other day, she trimmed my bangs, but I had gotten used to not having them because they had grown out, and now they are driving me nuts! ...yesterday when I checked the mail there was a circular that had a coupon for chick-fil-a, you best believe I rummaged through the trashcan that is right by the mailboxes and found 4 more coupons!!! It's not as gross as it sounds, the trashcan is only used for discarded junk mail. I bet I'm not the only one that's done this. Admit it, you're shaking your head, thinking, "Yup, I've done that!" ...it looks like I got another W for this week in my ff league! ...unfortunately I am going to be here there and everywhere this week, so you should lower your expectations for my posts this week! I will post every day, but it may be several lame posts in a row, and for that I apologize, but it can't be helped. ...I hope Donny Osmond wins DWTS! ...I'm beyond disappointed that Jake is the next Bachelor! A few days ago my random fact for the day had to do with the fact that my dad helps me with my fantasy football team. Some of you might be surprised to hear that I have a fantasy football team. I thought I would share with you the progression of how I got roped into this silly little game. This is actually my 4th season to have a fantasy football team. My old friend Will started a league 3 years ago among the Jr. Staffers (Associates) in the office. I think the league has usually had 8 teams, 2 or 3 of which were represented by girls like myself, that really don't have a clue about the NFL, certain players, positions, etc. Yet, we chose to participate. The first 2 years that I played, the only thing I enjoyed about the league had nothing to do with fantasy football. You see, in any Yahoo fantasy football league, each team in the league has a logo for their team. Most people just use the typical football helmet and you can use 2 colors to distinguish your team. But there is another, far superior, option for your logo. You can also create an avatar that represents your team. For those of you who do not know, an avatar is a computer generated character that you can dress up. You can alter the hairstyle, eye color, facial expression, outfit, background environment, etc. There are crazy costumes they can wear, seasonal outfits, pets, sports equipment, etc. So, for the first 2 years I played FF, all I cared about was my avatar. Each week my dear friend, Rebecca, and I, would dress up our avatar in a new outfit. We barely even knew the names of the players on our teams, but you can rest assured that our avatars looked awesome. Each week would would try a new hairstyle, change our skin tone, add some accessories, whatever struck our fancy that week. Right now my avatar is dressed like a pilgrim with the Mayflower floating behind her. Last year, for the first time, I actually decided to take slight interest in my team. Don't get me wrong, I didn't put too much time into it, but this guy I knew from college would look at my team for me and make some suggestions about who to play and who to bench, nothing too intense, mind you. This year, I've gone off the deep end! It all started with the draft. The guy who is now in charge of the Jr. Staff league at Tallowood, insisted that we do a live online draft this year. I was very resistant to this idea, but was forced to get on board. So, I called my dad and asked him for advice on who to draft first, which teams to watch for, which positions to worry about, etc. Well, after I had put that much effort into drafting my team, you best believe I was going to want to maintain my team and be sure that I was playing a solid team each week. And so it began, my dad became my agent. He looks up stuff online about different teams and players. He reads the paper and suggestions on fantasy websites. So far, I've done pretty well. I've had 2 rough weeks where a few of my players just decided to stink it up, but my 6-2 record has me in 3rd place. And actually, I'm watching a game right now, hoping my player does well...what have I turned into? Side note: my friend, Rebecca, is in first place, 7-1, and she still doesn't care a lick, barely knows who is on her team. They guys hate it that she is winning! Random thought/fact for the day: Got my haircut yesterday...you know how much I love being pampered! Mo Pro Joe was a lot of work, but really awesome! Today I did as little as possible. Better post tomorrow, I promise. Random thought/fact for the day: The quesadilla from Freebirds is very messy! Bonus fact: The movie "Dance Flick" is ridiculously lame. Turned it off after about 20mins. A precious friend of mine has a running tab on her blog of reasons she needs a husband. I keep coming up with moments when I feel extremely single. So, I think this will be my running list that I sporadically add to. Single moment #1: When the man taking pictures for the church directory tells me to get my family together and come take our picture. Dude, you're looking at my family! Single moment #2: When eating dinner with all couples and when the check comes, telling the waitor everyone is paired up, except you, you'll be on a ticket by yourself! Single moment #3: After church on Sunday when your normal lunch buddy is out and you don't have a built in person to eat lunch with. Random thought/fact for the day: When I order potatoe skins at a restaurant, I use sour cream, ranch dressing and ketchup. Yes, all in one bite. I've been trying my best to not just give you totally lame posts, just to fill the nablopomo daily requirement, but today, I regret to inform you, that's all you're going to get. For you see, I'm off to "The Show." A dear friend of mine and I like to go to "The Show" together. 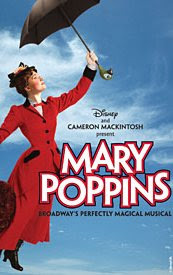 Tonight, our feature event is Mary Poppins!!! I couldn't be more excited! I've heard the reviews are just wonderful! So, yes, you can expect a report, maybe not tomorrow, but for sure at some point this weekend I'll be sure to update you! Yeah, and sorry, tomorrow's post might not be terribly thrilling, as I'm helping with a fundraiser for Aid Sudan...check it out at their website, here. If you're in the Houston area, you should join us! 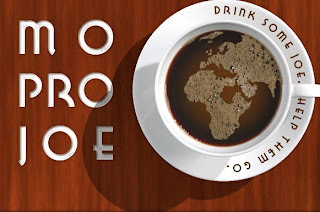 The event is called Mo Pro Joe. It raises money to send Sudanese missionaries back to Sudan! It's going to have a nice coffee shop feel to it, and yes, I might have something to do with the ambiance of it all, seeing as how a few of my friends and I are the "room set up and decor team." It starts at 7pm tomorrow night at the Tallowood Center Worship Center. Call me for details or look at the website. Random thought/fact of the day: Don't go to the post office unless you have a minimum of 30-45 minutes to stand in line and wait to buy a few specialty stamps. The postal workers don't care how long the line is and are in no hurry to get you in and out of there in a timely manner. Next Tuesday my boss, her husband and I will road trip to Corpus Christi!!! I'm pretty excited! Here's the deal. When we moved into our new building with all new furniture, we had A. LOT. of furniture to give away. Several churches came and claimed their portion of the furniture. One of the churches that we had set aside some furniture for was a church in Corpus. For the past 18 months, we have stored the furniture for them, waiting for them to find a time and money to get a truck up to Houston to get the furniture. It hasn't been a huge deal, so we have continued to store the furniture. Anyway, long story short, the place where we are storing the furniture is being rented out and now we really have to get rid of the furniture. I told my friend from the church, if they couldn't come get the furniture soon, we'd have to give it to someone else. She understood and said we should probably just let someone else have it. As sad as this made me, I didn't think we had another choice. When I told my boss that we needed to find another church or group that could use the remaining furniture, she was equally as sad. She suggested that we pay for the cost of renting a van/truck for them to come get the furniture. Then we began dreaming about us driving a van down there and personally delivering the furniture!!! Super fun!!! So, that's what we're doing! We'll head out Tuesday after lunch, deliver the furniture, stay with my parents and then head back to Houston some time on Wednesday! This is a rather small church that will really be blessed by this furniture! I can't wait to help them set it up! Random thought/fact of the day: I'm very afraid that my Christmas shopping is going to sneak up on me!!! Trying to think ahead and spread out the spending...but it's so hard when you have a family as big as mine! Gotta get on it! yesterday I ventured to the mall to attempt to make 2 returns. The first return was more of a complaint. 2 months ago I purchased a new cover for my iphone. I am one that is fanatical about protecting my phone and therefore am willing to make an investment in a nice/good/sturdy cover for my phone. Yes, I consider $30 for a piece of plastic/rubber to be an investment. Well, not even 6 weeks after I had purchased said case, it had developed an air bubble and began pealing. I have been fed up with it and frustrated that the $30 case didn't even last 2 months! So, I took my damaged case into the apple store only to be told that since it is not an apple product they can only honor the normal 2 week policy on returned items. If I had an issue with the product, then I should contact the company, incase. I went home, found the incase website and filed a complaint. I find it is much easier to be irate when typing than when speaking to a sales rep in the store. I heard back from them today, I will admit, I was impressed with their prompt response. They said that I would need to fill out an official product complaint form. I did so, but found out that I would have to have proof of purchase. I had already done a somewhat thorough search for the receipt and had no luck in finding it. But I did remember that apple offers to send you an email receipt. I had opted not to receive that email receipt, but figured they could look it up and resend me the receipt. So you best believe that I got on the phone to the apple store that I purchased the incase iphone cover from, they were extremely helpful and sent me the receipt in no time at all. So, I was able to fill out the form, complete with proof of purchase AND a picture of the faulty case and I'm hoping to hear back from them saying that they will replace the case...I'll let you know how it works out! I don't normally do something like this, so I was very proud of myself for going through all of those steps to see that I get my money's worth! Return #2 was a sweater that my mom had purchased for me about a month ago when I went to Corpus. When I got it out to wear it a few weeks ago, I found some discoloration around the hemline. I took it back to Macy's to make a simple exchange. Just my luck, I could not find the same sweater. For some lame reason I wasn't in the mood to shop. I had them check the price and one lady told me it was valued at something around $17. I knew we had paid more for it than that, but not much, so I figured if I got $17 back, it was better than nothing. I looked around a few more minutes, but decided I would just get store credit and shop later. When I walked up to the counter it occurred to me that I had probably used my Macy's card to purchase the sweater. A different lady at the counter helping me than before, scanned the sweater and said yes, I had purchased it using a Macy's card and could get a full refund on the sweater. Apparently I had paid $27 for the sweater, with tax, that was $30 refund that was going to go back on my Macy's card. This was working out great...until shortly after the refund was made, it occurred to me that my mom had paid for the sweater and the $30 had just been refunded to HER card...ugh! I just tricked myself out of $30! If only I had been in the mood to shop and had decided to make an exchange rather than a return, then I would have had $30 put towards that purchase as opposed to put back on my mom's card. Dang it, stupid stupid stupid! You best believe I called my mom and told her she owed me $30, even though it was her $30 in the first place...haha, I guess she can just put it towards my birthday present next month! Random thought or fact for the day: my dad and I talk on the phone more now that he's my fantasy football advisor than any other time in my life! We talk almost everyday about players to pick up, how my team is doing, did I win this week? what is my rank? Just a different way for him to be involved in my life, I guess! Two weeks ago my friends & I had a swap party! A few of us had heard about it and wanted to give it a try. Here's the idea. We all have clothes/stuff that we never wear/use. Weather you lost weight, gained weight or redecorated a room, you know your closets are full of things that others could be enjoying! So we all cleaned out our closets and pooled together our shoes, purses, jewelry, tops, bottoms, movies, books and a few random housewares. There are a few different ways that you can set it up. You can each bring your items and barter with each other, or you can give out tickets for each item you bring, making sure you only make a one-to-one exchange for every item you brought. We chose to make it a free for all, not worrying about if someone brought more than another person or if someone else left with more than you. Giving away stuff that you weren't using was enough benefit. It was SUPER fun to see your friends get so excited about getting "new" pants or shirts or purses. I'm not sure if it always works this way, but we had a good range of sizes and things that no longer fit one person, looked GREAT on another friend! Seriously, a few of the girls walked out with several bags of loot! The whole process was just really fun, trying on clothes, making outfits, saying, "oh, this would look great on you, try it on!" I've been carrying a purse I got at the swap and have gotten several compliments on it! I also just watched a movie that I picked up at the swap and thoroughly enjoyed it! I would highly recommend the swap, and if you decide to have one, invite me! Random thought or comment for the day: I just found out tonight that my hair stylist lives right below me! Seriously! We ran into each other in the parking lot tonight! That reminds me, I need a haircut! Today is the beginning of NaBloPoMo!!! I'm looking forward to reading other daily posts of friends that have accepted the nablopomo challenge. So if you're a blogger and hadn't thought about joining us in this month long marathon, please reconsider! It's really fun to have daily posts to read! In case any of you were wondering, my annual Hallo"wii"n costume party was canceled :( So no fun pics to share this year, which would have been challenging anyways seeing as how I don't have a camera right now. But for those of you who were wondering, I was going to be an iphone! I was really excited about my costume and already purchased a few things to begin constructing it, but at the last minute, we had to cancel our party, for various reasons. Last night my church tried a different version of a "Fall Festival", one that has been used at many churches for several years now, Trunk or Treat. Of course, trying something new usually takes some getting used to, but it was a huge hit! The cars looked great, the kids were cute and had a great time! Of course the inflatables were popular and everyone loves some cotton candy and popcorn on a night like last night. Oh, and the weather was AMAZING!!! Awesome night to spend outside!